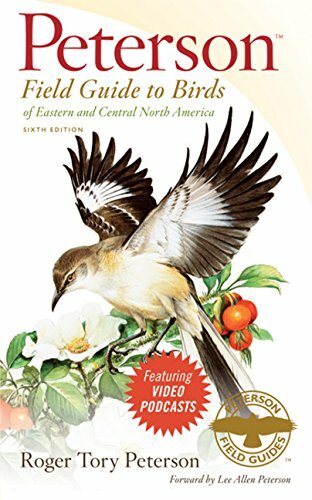 This is the latest addition of the Peterson field guide classic for birds of Eastern and Central US & Canada. The Peterson method of identification uses highlighted ID marks to quickly identify birds in the field. This method is especially useful for beginners to learn key field marks that help distinguish between species. The high quality artwork is in the classic Peterson-style. Several species are shown per page to the right of the fold; text descriptions and thumbnail maps of winter and summer ranges to the left . The Peterson field guides include larger, more detailed maps in the back of the book and comprise about 25% of the field guide’s pages. Many birder’s prefer the layout of other guides such as Sibley’s for the greater details available when just one or two birds are displayed per page. Guide to birds of eastern and central north america guides a unique identification system, which has been called the greatest invention since binoculars. This guide is illustrated with drawings and photographs in color and black and white and all provide up to date range information and the most useful descriptions, pinpoints key field marks for quick recognition and easy comparison of species. Measures 4-1/2-inch length by 7-1/4-inch width.